A team of astronomers has observed the magnetic field of a galaxy five billion light-years from Earth. The galaxy is the most distant in which a coherent magnetic field has been observed and provides important insight into how magnetism in the Universe formed and evolved. The observation shows a magnetic field of a similar strength and configuration to that seen in our own Milky Way Galaxy, even though the distant galaxy is five billion years younger than ours. This is evidence that galactic magnetic fields form early in a galaxy’s life and remain relatively stable. 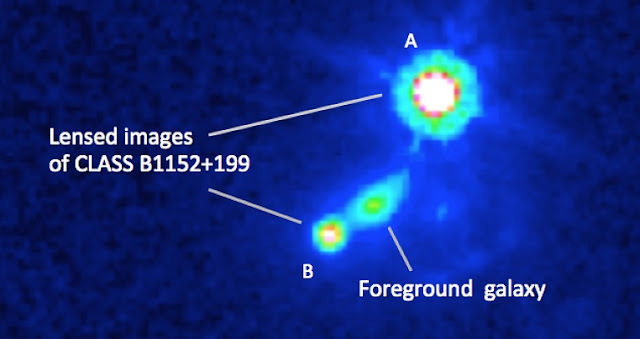 “This finding is exciting,” says Dr. Sui Ann Mao, an astronomer and Minerva Research Group leader at the Max Planck Institute for Radio Astronomy and lead author of the paper describing the observation. “It is now the record holder of the most distant galaxy for which we have this magnetic field information.” The paper was published August 28 in Nature Astronomy. Galaxies have their own magnetic fields, but they are incredibly weak—a million times weaker than the Earth’s magnetic field. One theory suggests that the magnetic field of a young galaxy starts off weak and tangled, becoming stronger and more organized over time. But, because the magnetic field of the observed galaxy is not much different from the fields we observe in our own Milky Way Galaxy and nearby galaxies, the detection is evidence that galactic magnetism appears relatively early, rather than growing slowly over time. Studying the evolution of galactic magnetic fields requires observations of galaxies at different distances from us because such observations show us galaxies at different ages. But these observations are difficult to make, in part because a magnetic field can’t be detected directly. Instead, we can only detect one by observing the magnetic fingerprint it leaves on light passing through it—an effect referred to as Faraday Rotation. Mao, Gaensler and their colleagues were able to make their observation because a quasar—a very bright and distant galaxy—lies beyond the galaxy being studied, along the same line of sight. Thanks to this chance alignment, the quasar’s light passes through the galaxy’s magnetic field on its way to us, picking up the tell-tale Faraday Rotation fingerprint. The observation was made using the Karl G. Jansky Very Large Array, an array of radio telescope dishes in Plains of San Agustin in the New Mexico desert, operated by the National Radio Astronomy Observatory.